Hen's Tooth Video proudly presents two of the most successful Spaghetti Westerns ever made in a boxed set edition. Terence Hill (Mario Girotti) and Bud Spencer (Carlo Pedersoli) star in these wildly popular spoofs of the Italian Western genre. 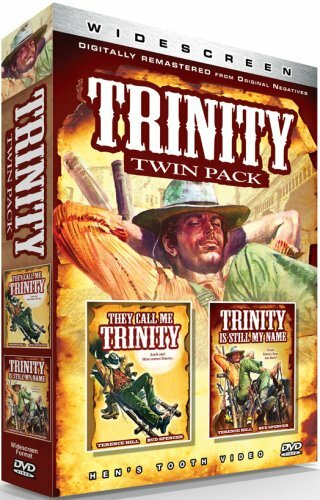 THEY CALL ME TRINITY and TRINITY IS STILL MY NAME are presented here for the first time in their theatrically correct anamorphic widescreen ratios, mastered from magnificent Technicolor prints. These comedies paved the way for Mel Brooks' Western send-up Blazing Saddles and made international superstars out of the team of Hill and Spencer, ushering in a twenty-five year association for the two actors. Together and separately they worked with some of the best Italian directors in the business (Sergio Leone, Sergio Corbucci, and Luchino Visconti). The Trinities were followed by hits like Crimebusters, Miami Supercops, Odds and Evens and countless others. Sit back and enjoy a double dose of Western comedy, Italian style!